It’s ICYMI time for the week of September 29th! 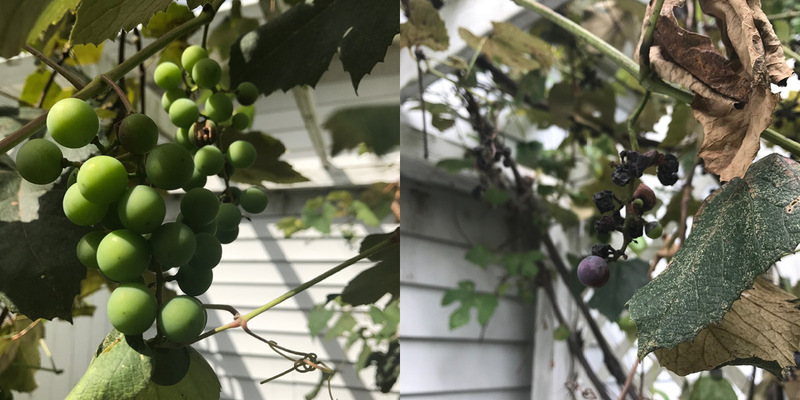 The last week of September. Deep breaths. Deep breaths. 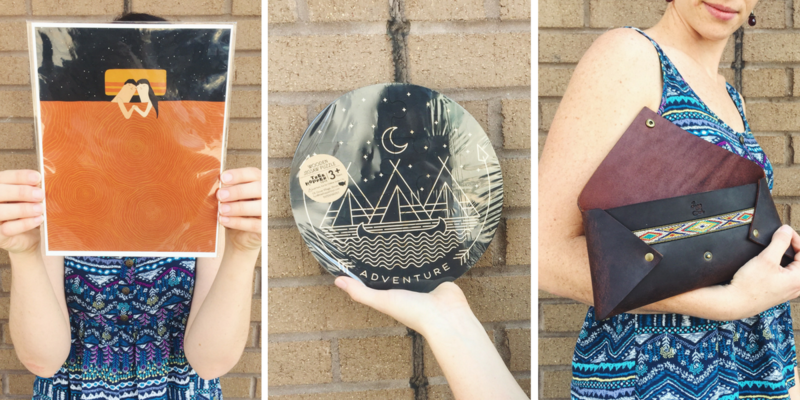 Okay, we have a bevy of beautiful goods to show you! For example, check out the edgy, modern line from Grey Theory Mill. Patina, brass, and bead come together to form this ethically sourced collection (all the earring posts are made with grade A surgical titanium for sensitive ears too). 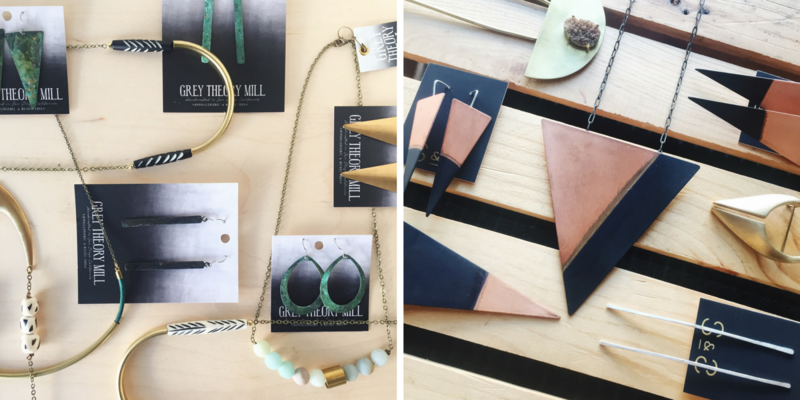 Add a little danger to your wardrobe this fall season with Solder & Sage. I’m gushing over that oversized triangle necklace. Her collection has everything from hairpins to brooches to earrings. With jewelry, it’s okay to be a little dramatic sometimes. Remember those clever baby onesies from Paper Elm Designs? Well, they come in toddler and youth sizes too. Attitude not included, but probably just comes naturally. More designs can be found in store! What has our Inventory Manager, MK, been up to lately you ask? The answer is everything. She has been doing everything. And here she is receiving a huge order from People for Urban Progress. Look at those new bags! Bringing out the big guns for holiday you guys. Have a puzzle party, or just scratch some things off your Christmas list with this restock from Tree Hopper Toys. This toy line is both durable, safe, and designed with the contemporary family in mind. There is so much more in store, and I’ll be showing you something from them each week for the next month most likely! With the holidays coming up, if you’re anything like me, you’ll be running around catering to lists, recitals, and freaking out over what you’re bringing to what dinner. 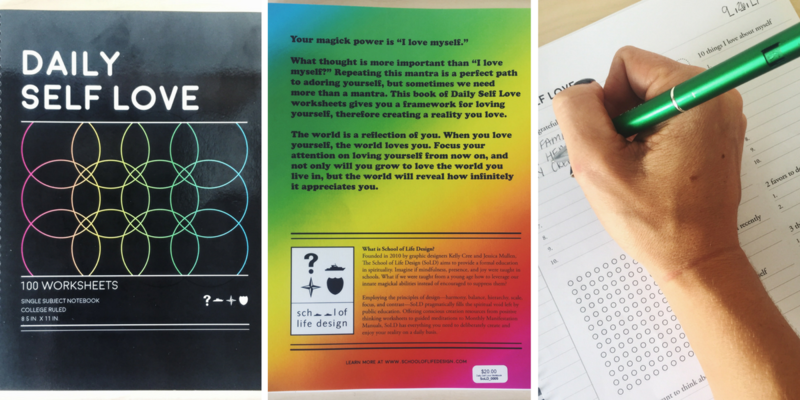 Slow down with Daily Self Love worksheets from School of Life Design. Our staff has been enjoying filling them out in store, and I think you’d enjoy them too. 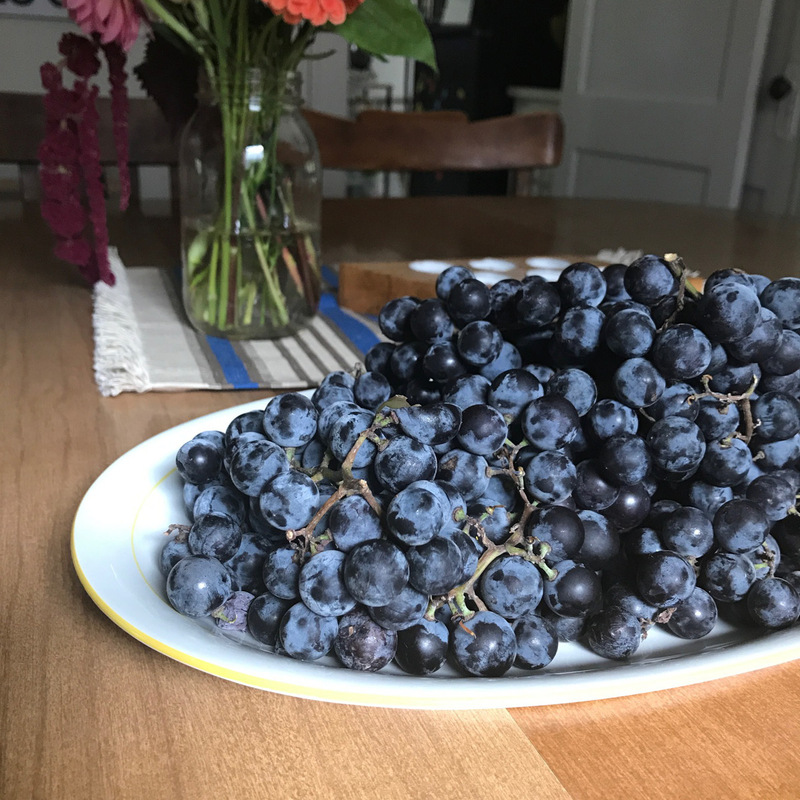 You know that about half of our vendors are local, but did you also know that the majority of our other vendors are local to the Midwest? Keepin’ it in the family y’all. 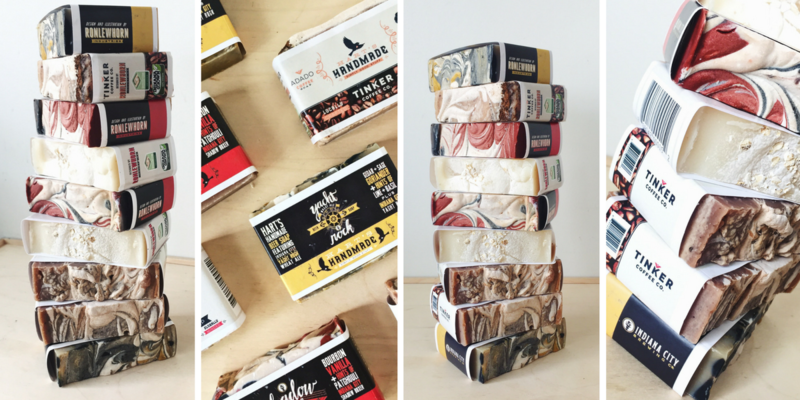 We’ve been stocked with new candle scents from local favorites The Onyx Exchange. The Rosemary Pepper one smells like CHRISTMAS! 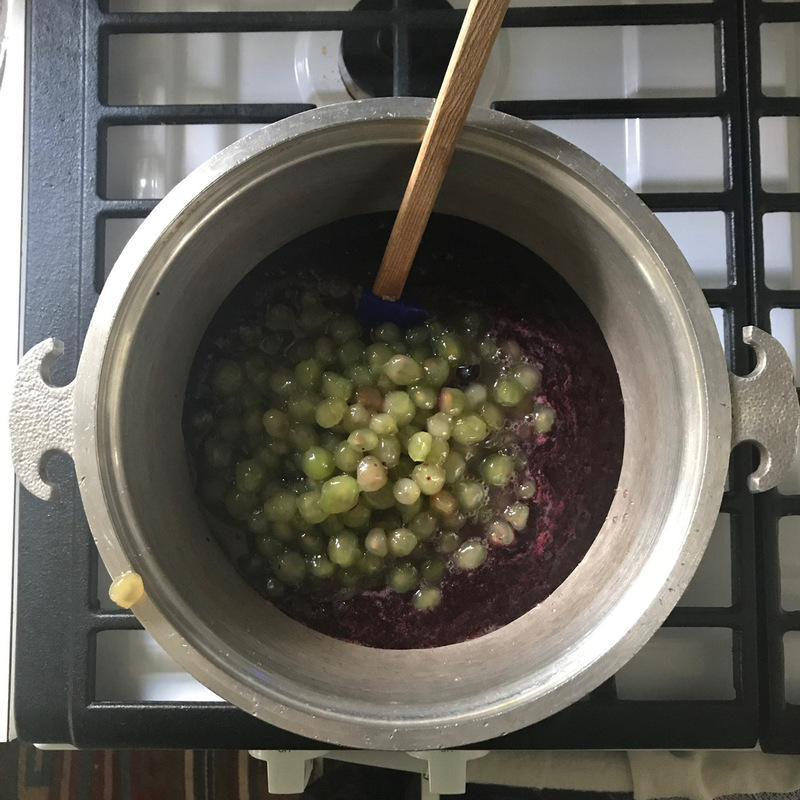 And while you’re making your house smell wonderful with a new candle, you can be drying your dishes with new screen printed towels from Kate Brennen Hall. Yes, those are puppy faces. And yes, there’s quite the selection in store. More hints for Christmas, the fabric button earrings from Pointelle Designs fit neatly into a stocking, and it wouldn’t take you long to wrap up one of those Indy Writes Books anthologies from Indy Reads. -All the proceeds from the purchase of the books help fund adult literacy programs. 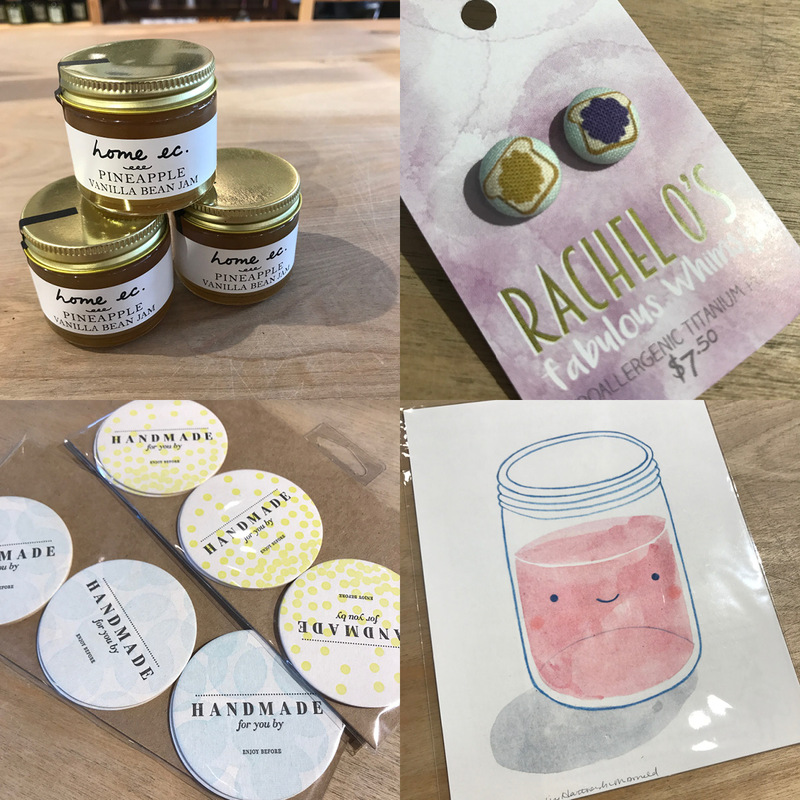 This week our Assistant Shift Manager, Grace, showed us a few of her favorite things around the shop. Holding a BFA in sculpture from Herron School of Art & Design, the love of pattern runs deep with Grace. Each piece chosen contains an element of repetition. 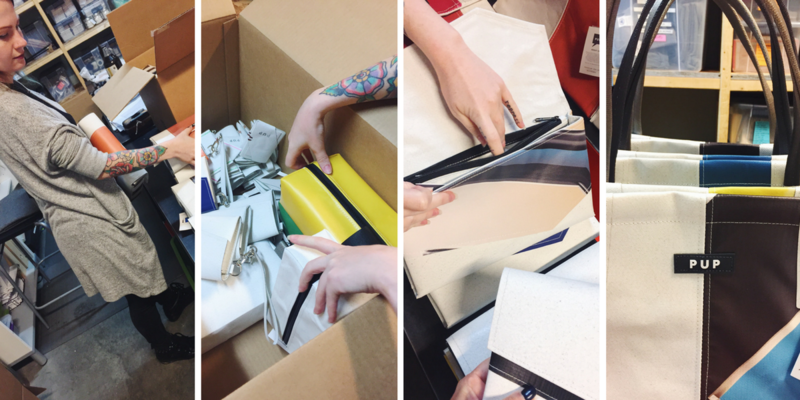 -From the Laura Berger print, to the Tree Hopper Puzzle, to the LM Products clutch, each item is definitively Grace. That concludes this week’s ICYMI for September 29th! I can’t believe I’ll be greeting you next week in October! Be sure to keep following us on all our social platforms (Instagram, Facebook, Twitter, Pinterest). We have a giveaway coming up! Stay tuned! Wishing you all a happy, handmade weekend! It’s ICYMI time for the week of September 22nd! Anyone else freaking out that September is almost over? -Glad I’m not the only one. 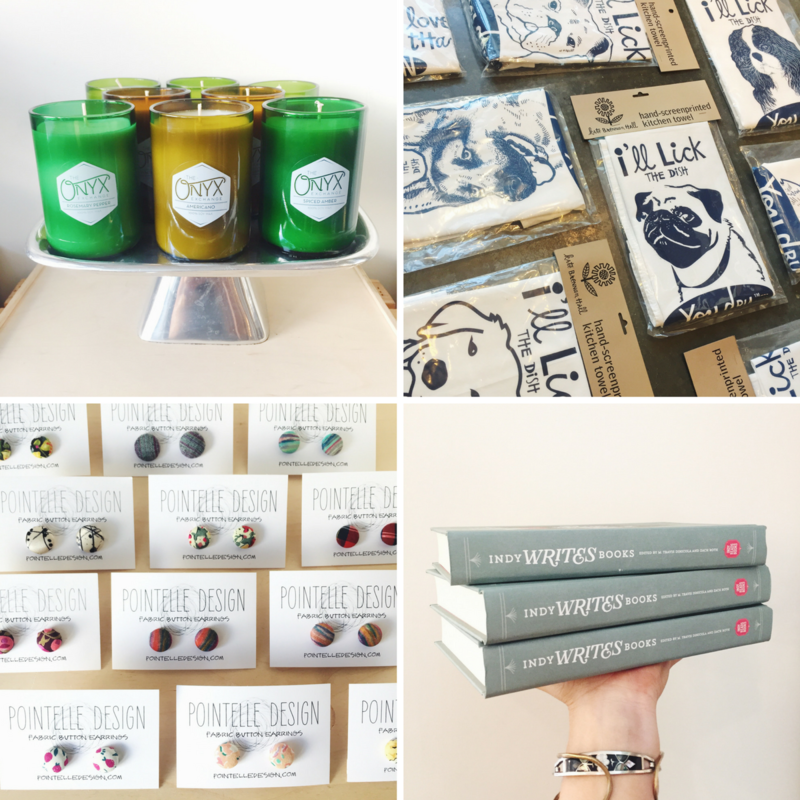 While that fall air attempts to return, we have product overflowing in the shop in preparation for… h o l i d a y. And why not start your list early with a restock from one of our bath and body favorites, 407 Botanicals. 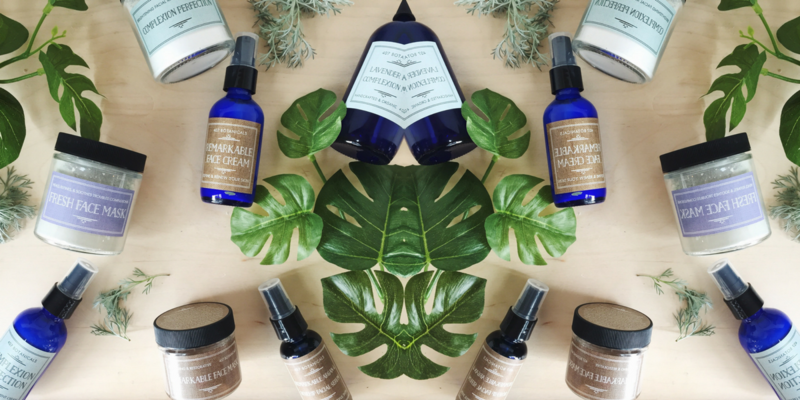 Using beneficial botanicals and healing essential oils, you can have an entire skincare regime made from natural ingredients! -An easy way to get on the nice list. Have you been looking to add some eclectic flare to your decor? 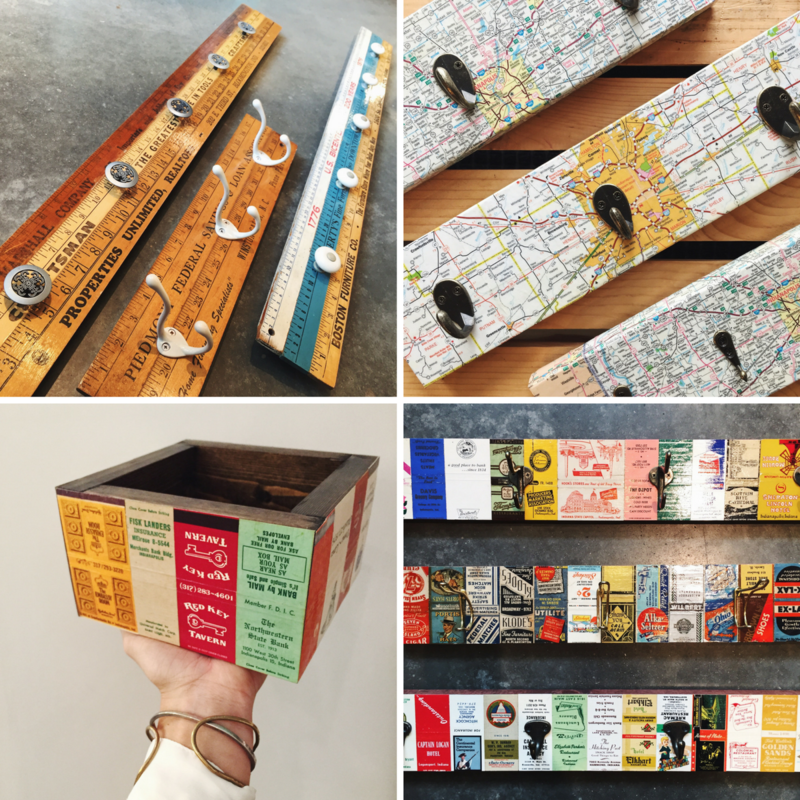 Indyardart repurposes vintage yard sticks, Indiana maps, and matchboxes to create these sought after hook boards and housewares. And with the popularity of this line, we have a hard time keeping it on the shelves. So, we recommend getting here ASAP. Since we’re talking holiday lists early, we need to mention our library of Indiana, Indianapolis, and Midwest-centric reading material. 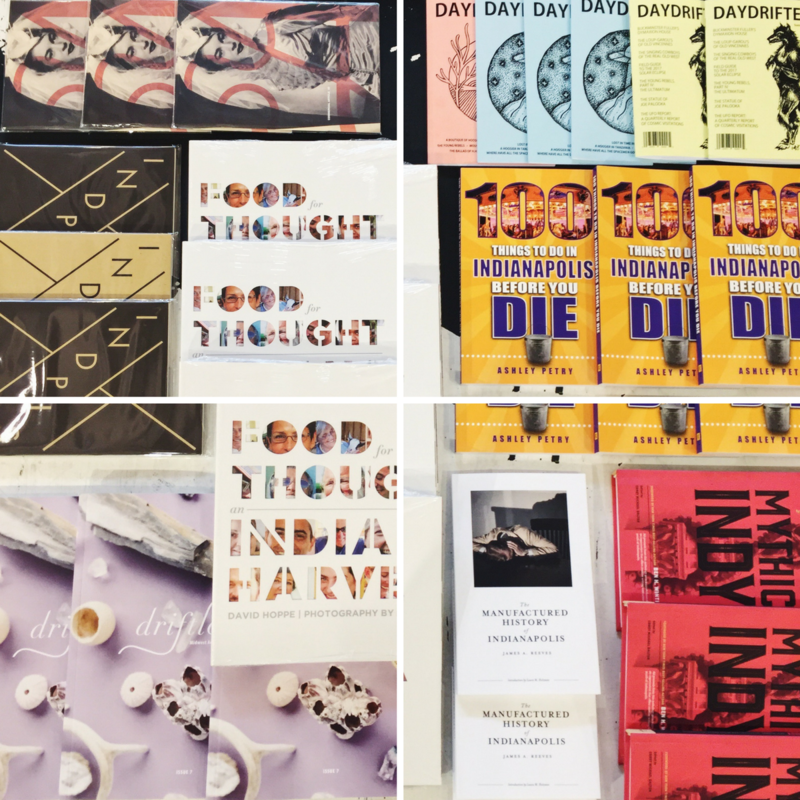 Get lost in the artistic history of Indiana with Commercial Artisan, get to know Indy from Printtext and Ashley Petry, and swim in Indianapolis fiction from James Reeves and the contributors of Mythic Indy. 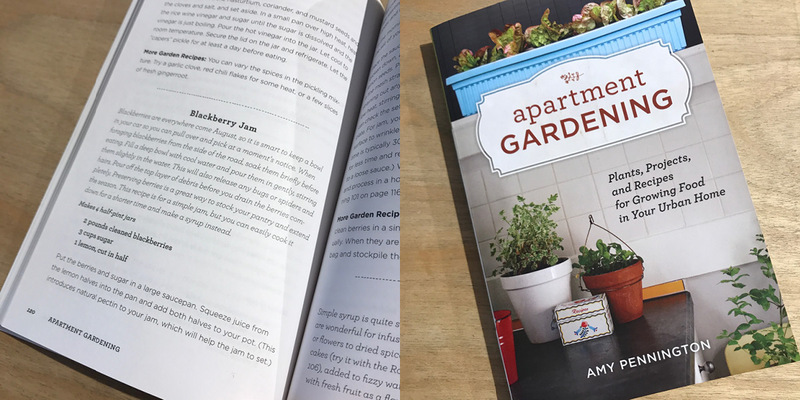 Basically, we have something for the reader in your life. 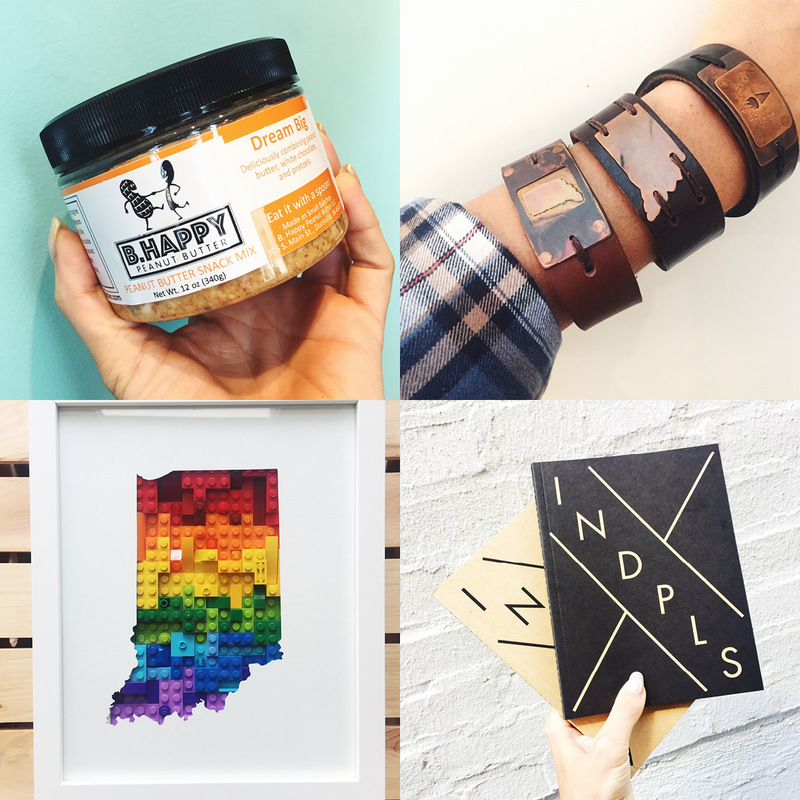 And it wouldn’t be an ICYMI post without featuring some of our new Indiana product! With half of our vendors being local to Indy and the Midwest, it’s likely we receive new, local product each week. 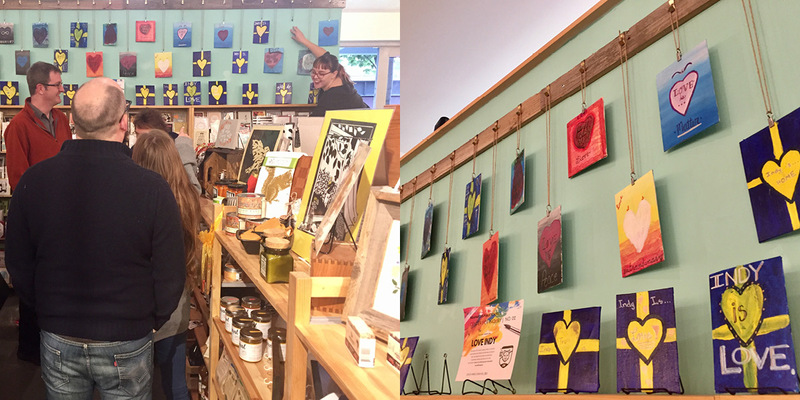 Check out New Art Studios’ original hand-painted Indiana wall hangings on the top left and go crazy with all the candy restock from New Fangled Confections! Did someone say Sweet and Spicy Pecans?! Remember last week when I told you there’s no way I’d be able to show you all of Hunky Dory Studio’s product in just one week? Well, I wasn’t lying. Check out the new glass Indiana nightlights up above! Oh, and there’s more in store, of course. Light up the room and your senses, too, with candles and reed diffusers from local favorites Penn & Beech. I recommend the “Old Books” scent. Don’t tell me you don’t love the smell of a used bookstore. 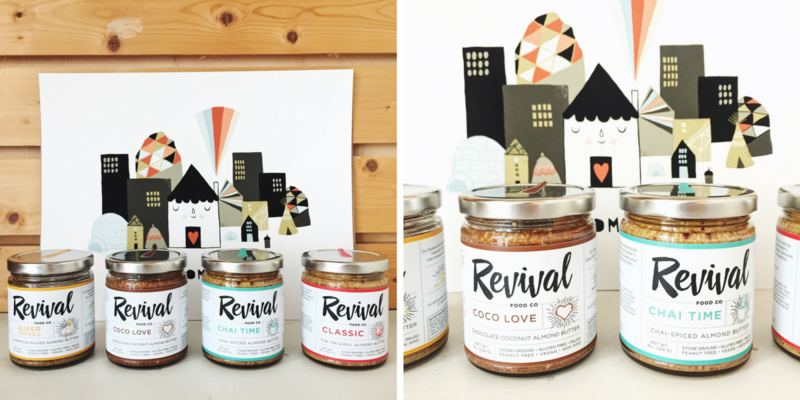 A happy home must include almond butters from local maker Revival Food Co. And if you’re wondering where to start, -the Coco Love and Chai Time flavors will surely take your toast game up a notch. This is Megan, our hard-working, hair chameleon (see how her hair matches the incoming product), master of purchase orders, Inventory Manager. MK works hard every day, and her job is getting even more ridiculous with the influx of holiday product. So, I thought we’d start a new segment, a glimpse into just part of her weekly mastery of inventory. 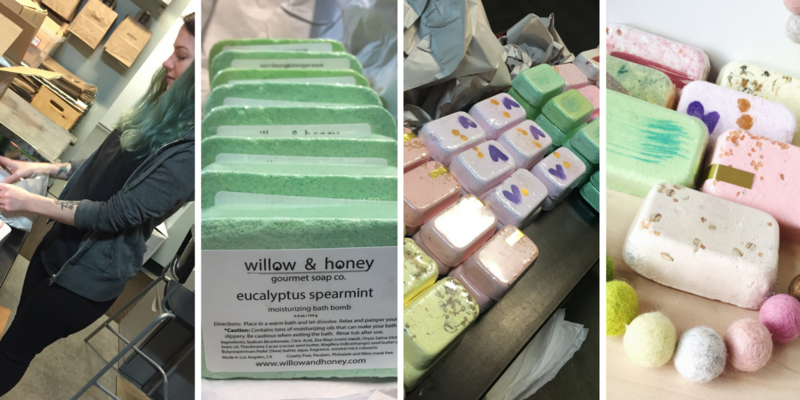 Above, Megan received a huge order from Willow & Honey, creators of some amazing (and glittery) natural bath bombs. There are so many scents! Getting them into our system, tagged, and out onto the floor (so I can take pretty pictures of them and you can buy them), is all MK. Slow clap for this girl. Do you remember the massive holiday gift guide we roll out in November? 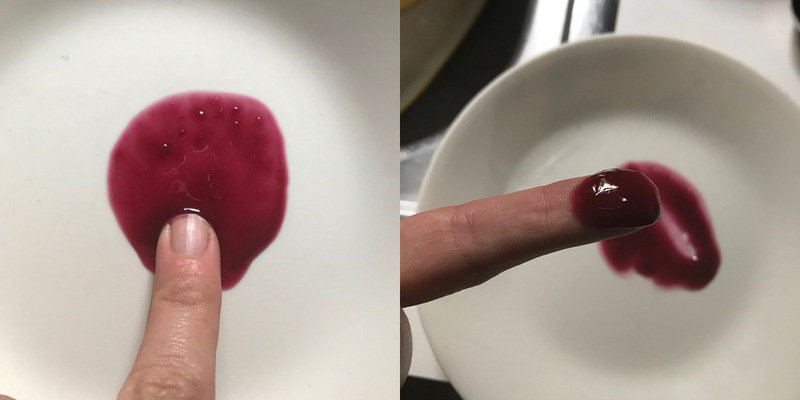 Well, I’ve been thinking about it a lot (and biting my nails over it -soooo many pictures to take). However, I thought we could have a little fun leading up to that. 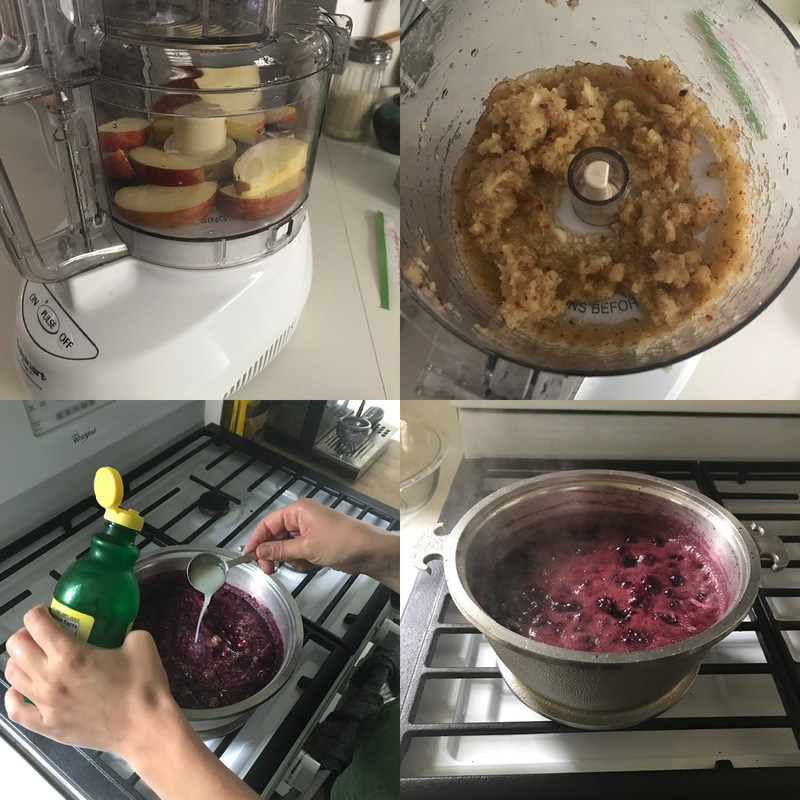 Each week I’ll be highlighting favorite products from different members of our staff. I decided to go first, -oldest child syndrome. As you might be able to tell from my ensemble, I’m a lover of neutrals and earth tones, especially when it comes to decorating. And I fan-girled hard when we received that fluffy white and cream weaving from Ribbon + Roving. I might have a wall hanging or weaving in almost every room of my house. But guys, how have you not purchased that yet? The little face card from Haven Paperie is perfect for my daughter to send to her pen-pal out in California. And all I want to put on my Christmas tree and mantle this year are garlands from Goldendrop Garlands. We do have more colorful ones in store too, but you know me. 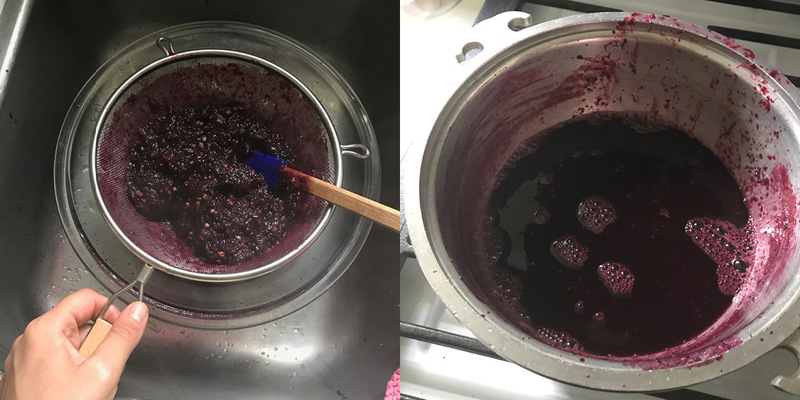 Get your jam on with Lee, our resident How-To blogger. 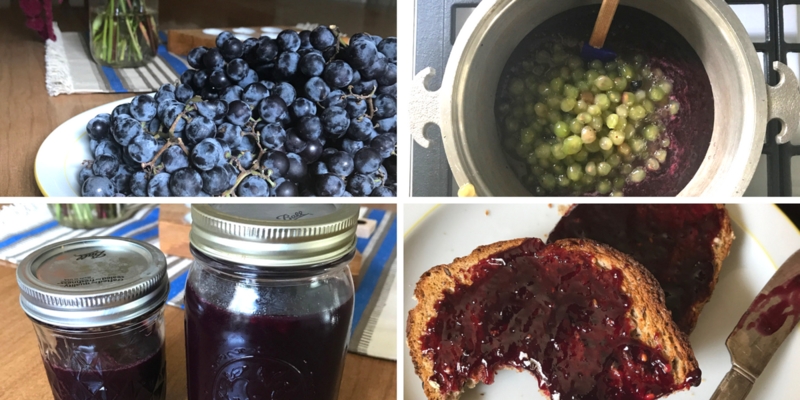 This month she’s teaching you how to make Concord Grape Jam! 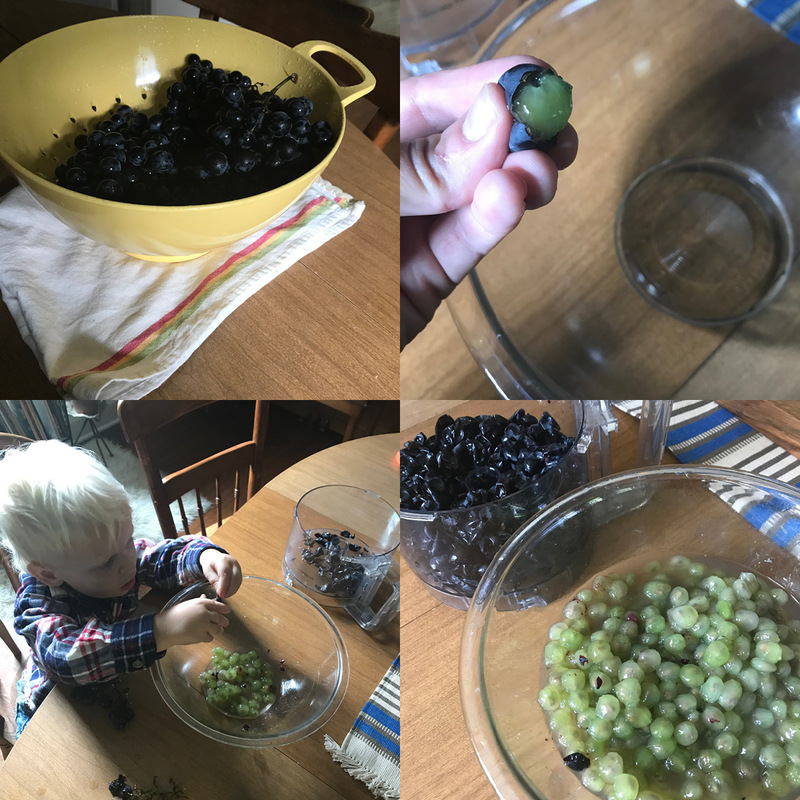 Get all the details and instructions here. 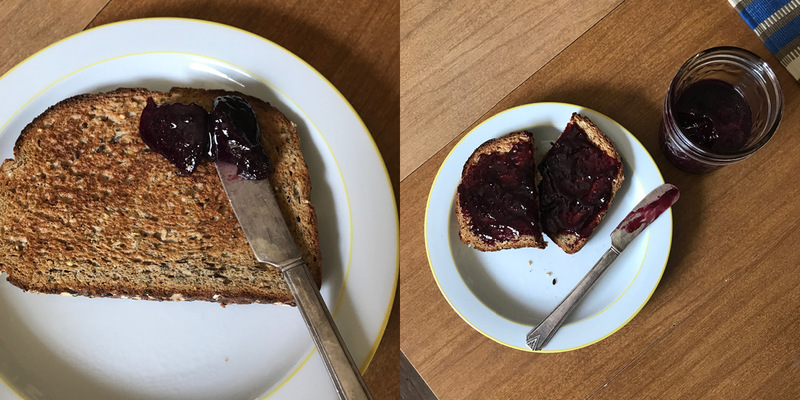 And when you’re done, feel free to bring me some jam and toast too, please. That concludes this week’s ICYMI for September 22nd! Thanks for keeping up with us and be sure to follow us on all our platforms (Instagram, Facebook, Twitter, and Pinterest), where you’ll get the most up to date info on product and events! Wishing you a happy, handmade weekend! PS – Due to high demand, ticket sales have reopened for our upcoming workshops! 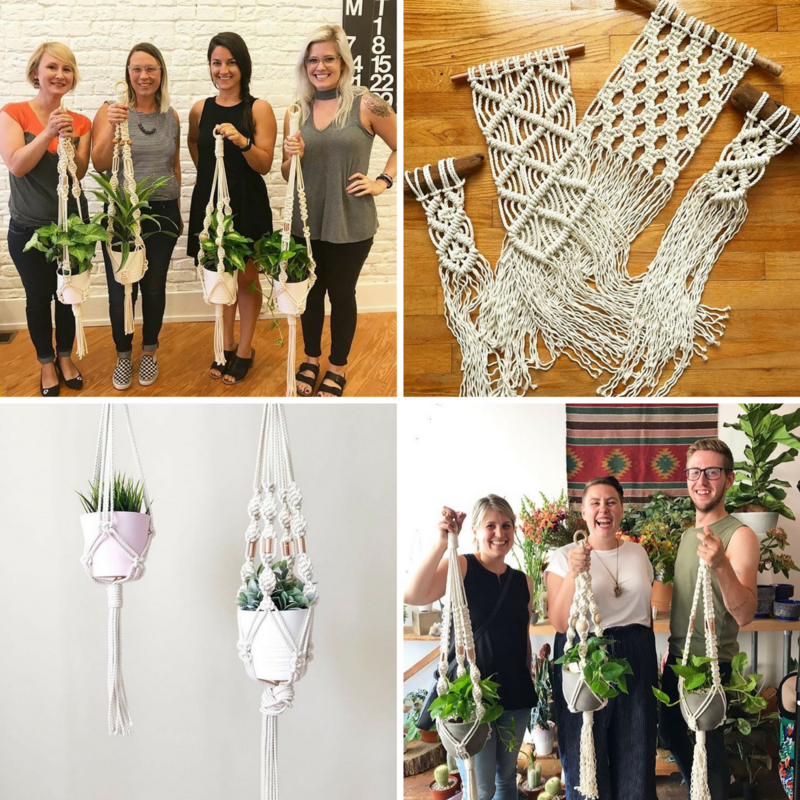 You have until tonight (9:00pm Friday evening, to be exact) to purchase tickets for our Macrame Hanging Planter and/or Macrame Wall Hanging classes! -Click on the links to go get yours now! 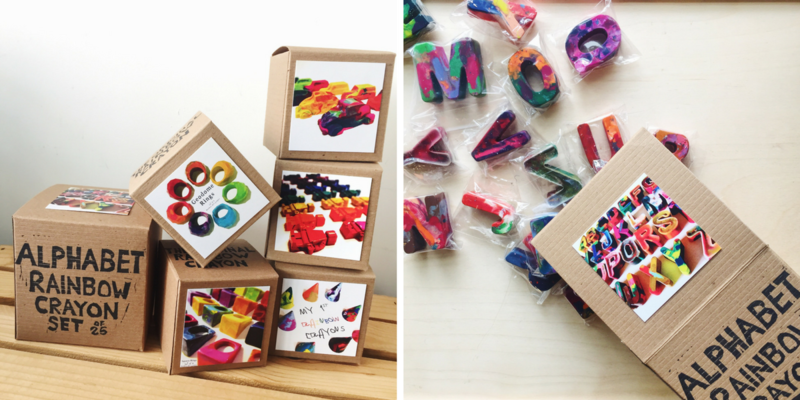 We’re back with another edition of ICYMI – This Week at the Shop for September 15th! 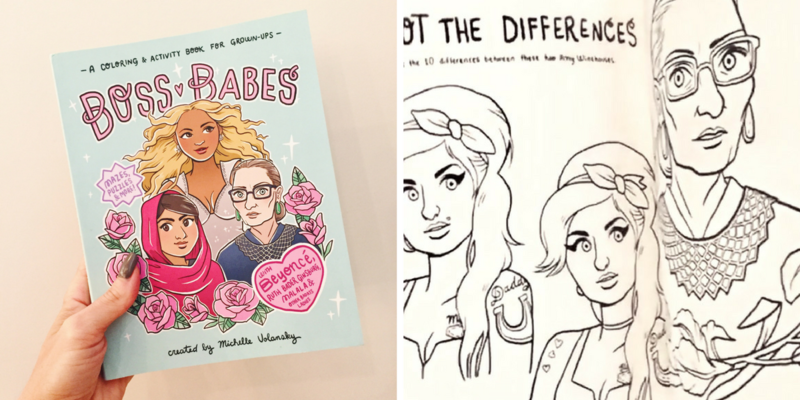 And look who else is back, Queen B, Malala, Ruth, and more! Michelle Valansky of Creature Type has created this power packed coloring book full of 90+ pages of activities and badass-ery. Yes, I want to spot the differences between the two Amy’s (RIP girl). 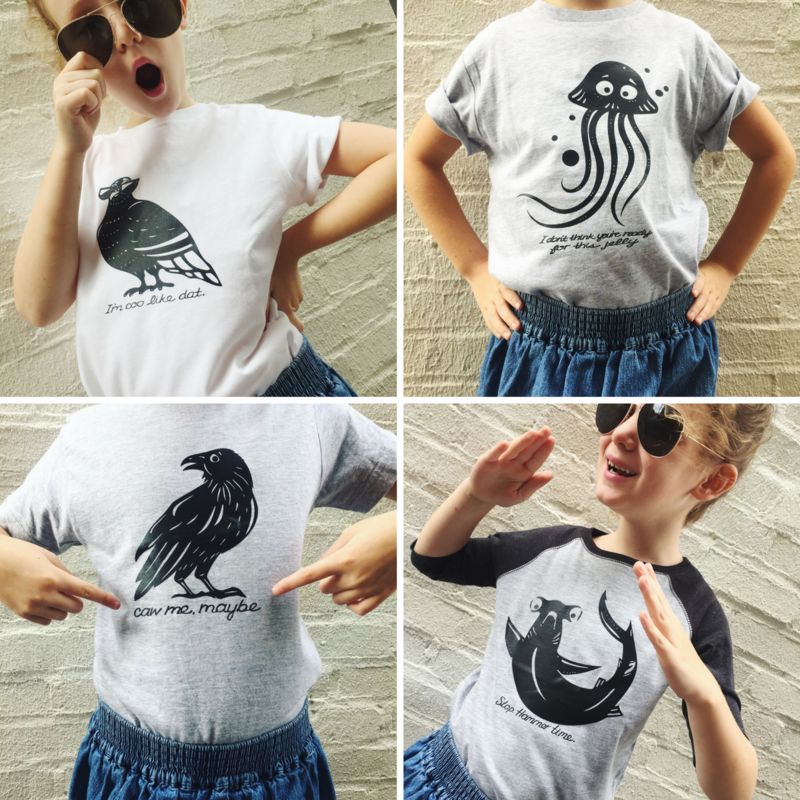 Let your little ones creep along in new onesies and t-shirts from Paper Elm. And while the little ones play, parents get to relax, right? 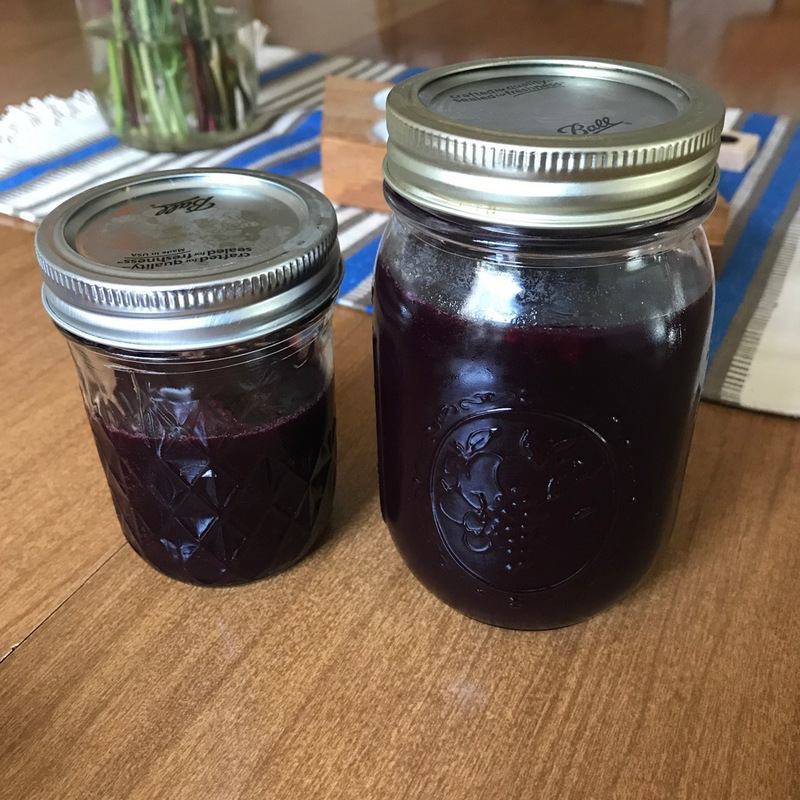 Well, if you get a minute, you should enjoy a cup of Bhota Chai (formerly Impeccable Chai) from Sobro Cafe in your brand new leather mason jar travel mug from LM Products. – Coolest parents on the block. 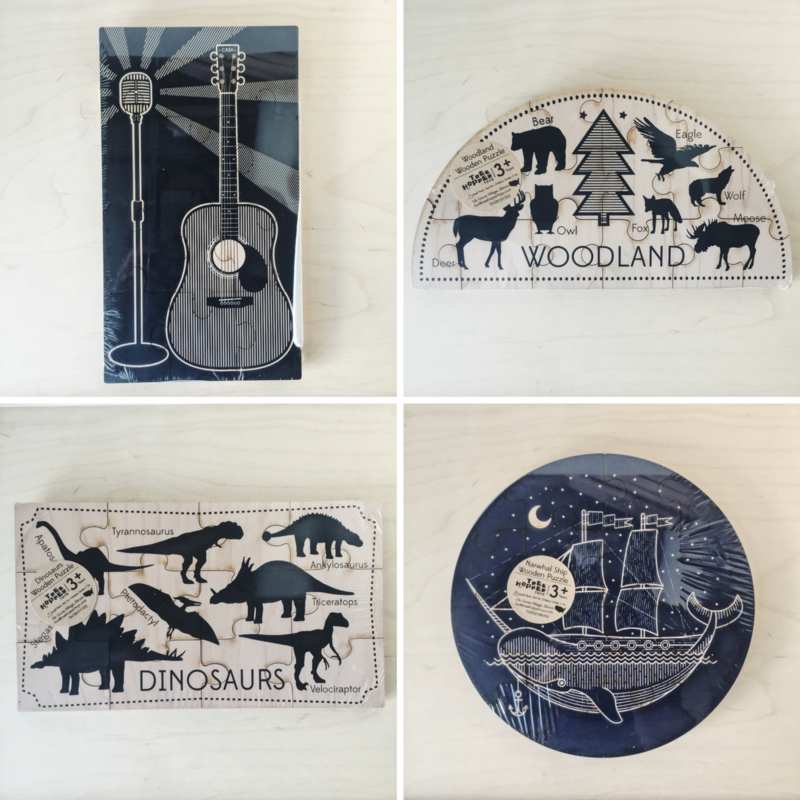 If you’re in need of a gift for the history buff in your life, look no further than the new designs from Rachel O’s Fabulous Whimsy. Each piece is made with a vintage Indiana map from 1899 or 1916! What I’m using to color my Boss Babes coloring book; rainbow crayons from Art 2 the Extreme, of course. Yes, the kids would like these too. New vendor, Hunky Dory Studio, puts more than Indy icons on her fused glass menagerie, but her inventory is so large, it’ll take me more than one week to show you it all! Stay tuned! I love handmade soap. I love pretty, handmade soap. And I especially love pretty, handmade soap made using local ingredients from other local businesses. So many wins. Remember those macrame classes I was telling you about last week? Well, they’re nearly one week away and tickets are still available. 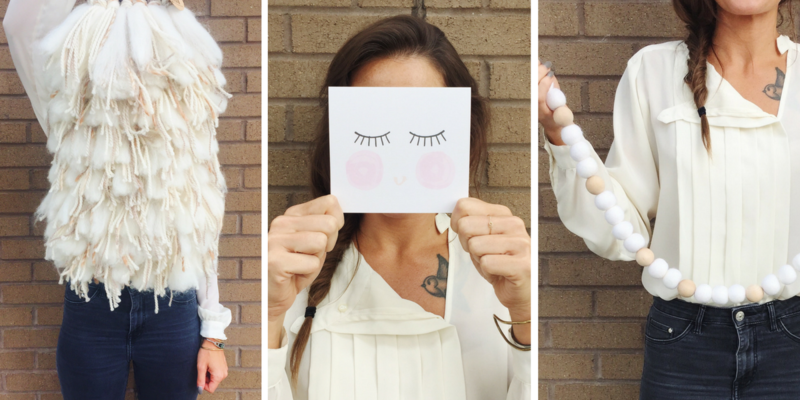 Look how happy you could be after you make a macrame plant hanger or wall hanging! PS – the plant and pot are included in the price of the plant hanger class! Columbus based fiber artist Sarah Harste is just the cutest and she’s driving across state lines to come hang with you! Both classes are also BYOB. I’ve given you so many reasons to sign up. So go do it here (plant hanger) or here (wall hanging). Get knotty! One more thing guys, -you need to join our rewards program, like yesterday. 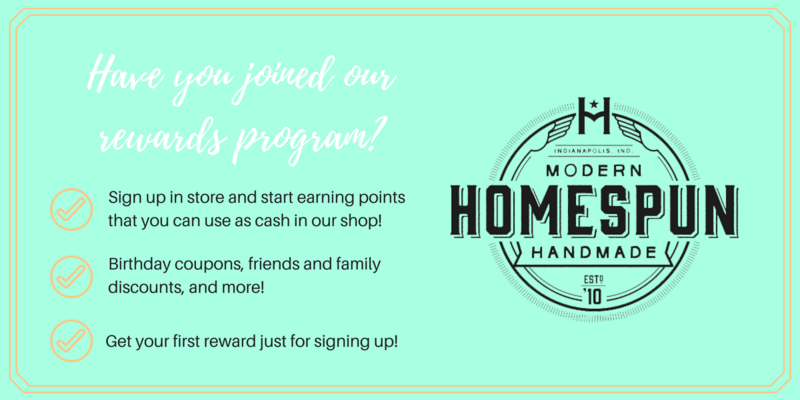 You earn points with every dollar you spend in store and those points become cash you can redeem on future purchases. We’ll also send you a birthday coupon and a discount just for signing up. I know, you’re running to the store right now. Well that’s it for this week’s ICYMI! If you get a chance to stop in and find something cute (like that’s hard), take a photo with your purchase and tag us on Instagram, Facebook, or Twitter for a chance to be featured on our page! The temperatures may be droppin’ but our shelves are hoppin’. – See what we did there? 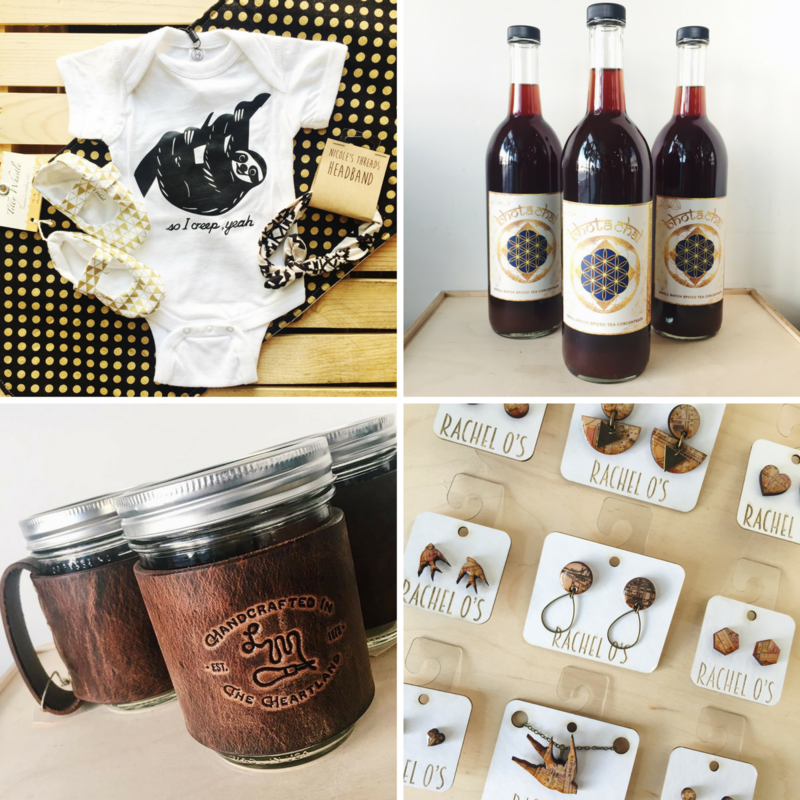 We’re starting a new ICYMI: This Week at the Shop blog full of new product, sales floor happenings, and store events! 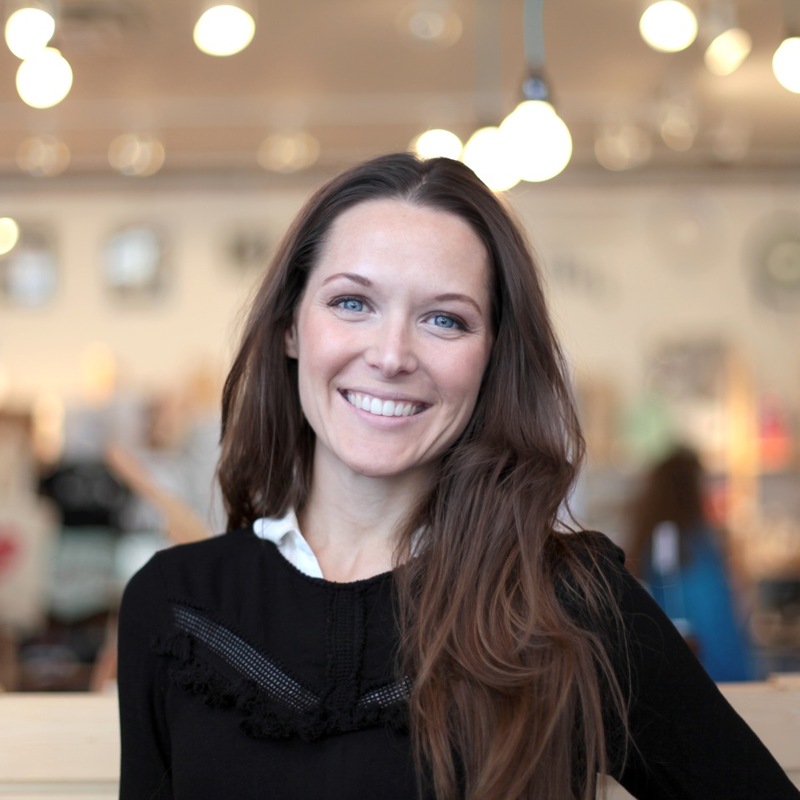 I’m Amanda D., resident Operations Manager (product photographer, social media slinger, event/gallery coordinator, and all things Homespun-related). 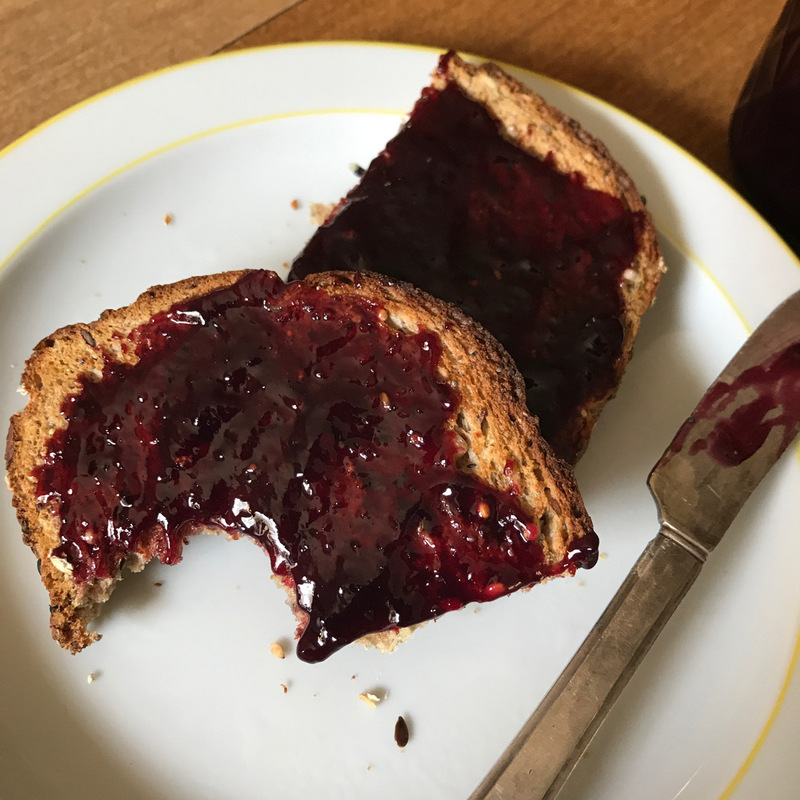 I’ll be your new weekly author, compiling all the things I’ve photographed and posted in the last week (like the new city flags above from People for Urban Progress), right here, so you can catch up on your weekly Homespun digest! 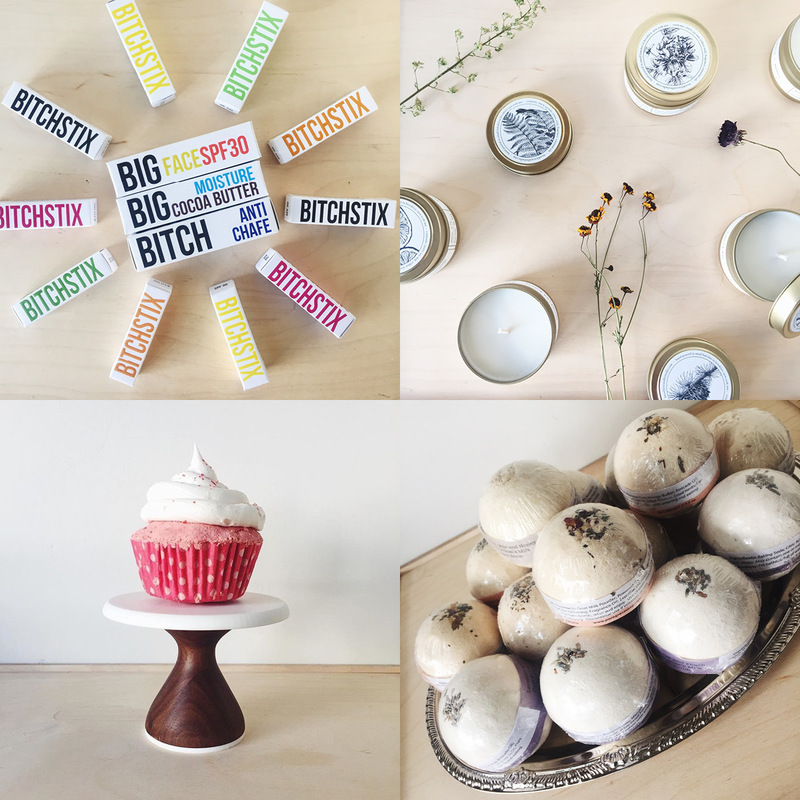 So here you go, ICYMI: This Week at the Shop: September 8th! Enjoy! I don’t know about you, but this chill in the air has me revving up my bathtub. Good thing we’ve been restocked with new bath and body products from favorite vendors like Bitchstix, Pure Grace Soaps, and Brooklyn Candle Studio. 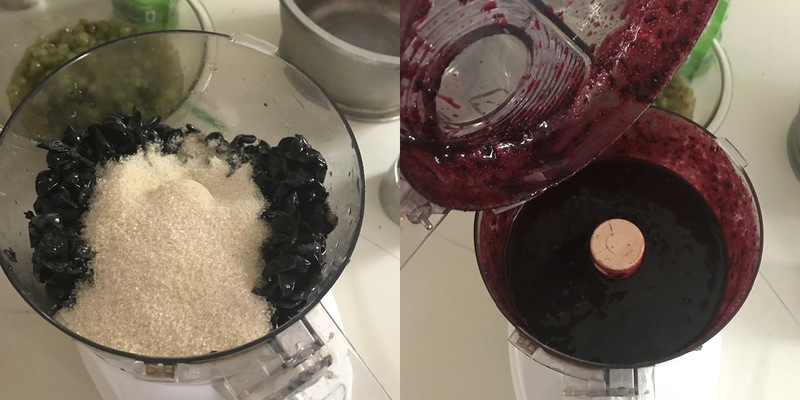 Yes, that’s a cupcake bath bomb. Someone get that water running stat. 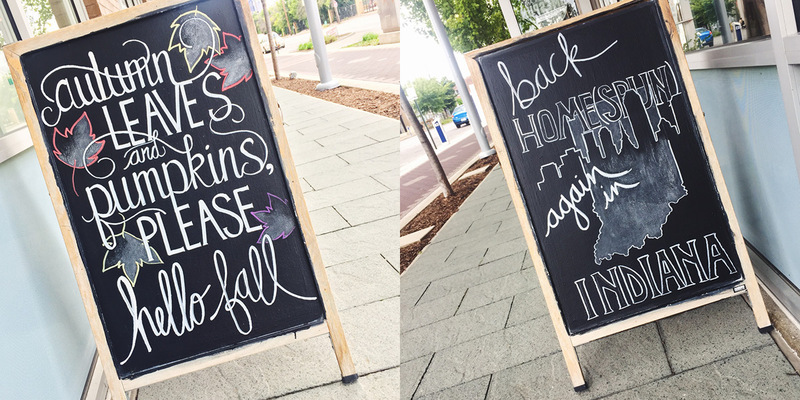 You know I couldn’t resist a good ol’ fashioned fall themed chalkboard. And an Indy one too, of course. These are always fun for me to do, especially when the whole staff gets together to help me come up with our handy little slogans. 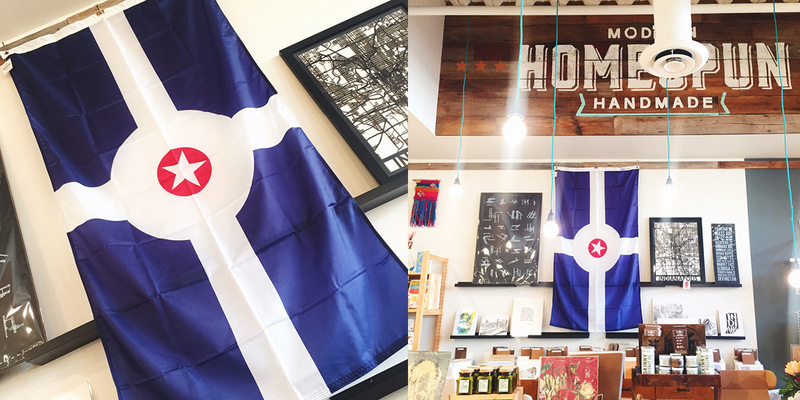 You can thank Key Holder, Claire, for the awesome “Back Homes(spun) again in Indiana” idea. High fives to Claire! 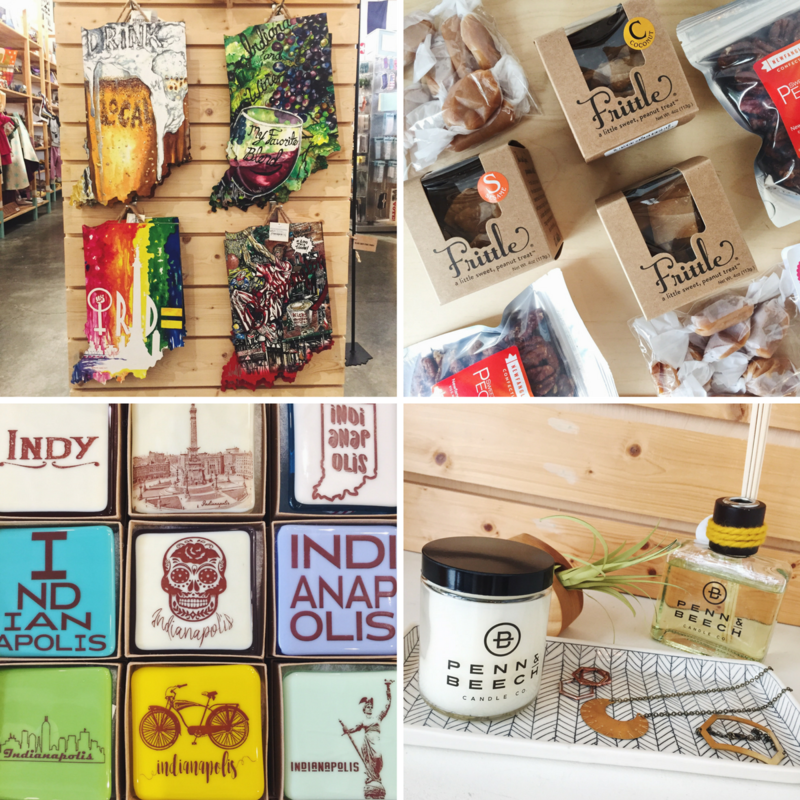 Did you know that about half of our 400 vendors in store are local to Indianapolis or Indiana? Did you also know I feature my own arms and hands in a lot of our social media photos – ha. Pro tip: that B. Happy Peanut Butter is absolutely divine on a s’more. You can thank me later. New leather Indiana cuffs from Indypsire Art have arrived, along with a new Pride Lego Art design from Smitten by Kat. 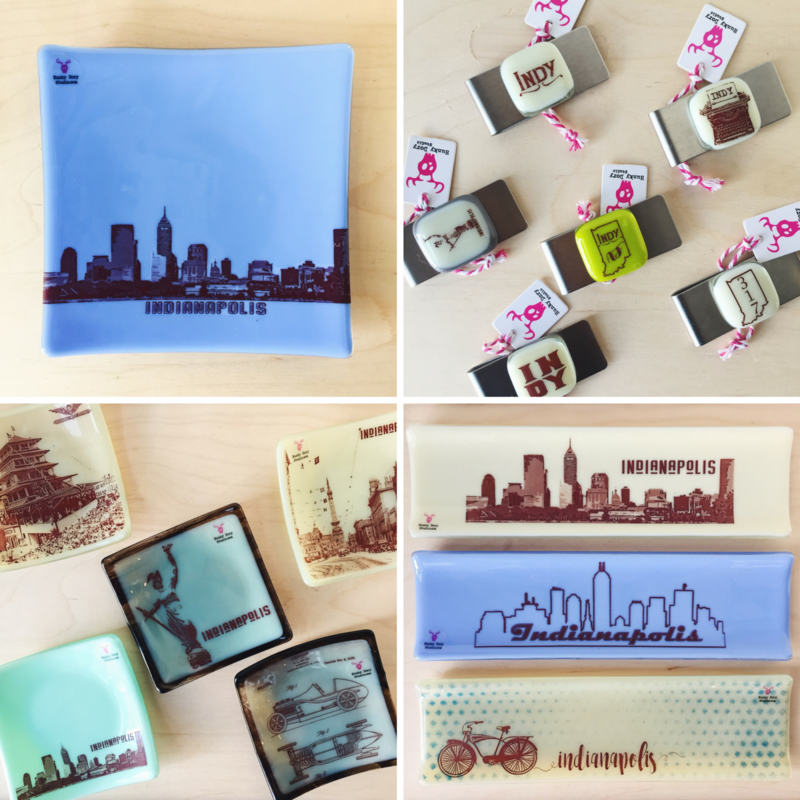 Show off to your out-of-town friends with the Indianapolis City Guide from Printtext. That black cover is limited edition, so you should come buy it now. We had an AMAZING turnout during our most recent First Friday gallery opening featuring the work of IPS Center for Inquiry School 2 Art Club! The students created work about what Indy and Love, both, mean to them. After recent world events, the students decided to donate 100% of the proceeds from the works sold to non profit agencies. If this doesn’t warm your heart, I don’t know what will. The remaining work will be on display through September and October. Come support these talented, compassionate students and the causes they care about so much! You still have time to get knotty with us in our upcoming Macrame Workshops with guest instructor, Sarah Harste! Sarah is a Columbus based fiber artist who loves all things woven! She’ll be hosting two workshops in store on Saturday September 23rd. Take one or take both! 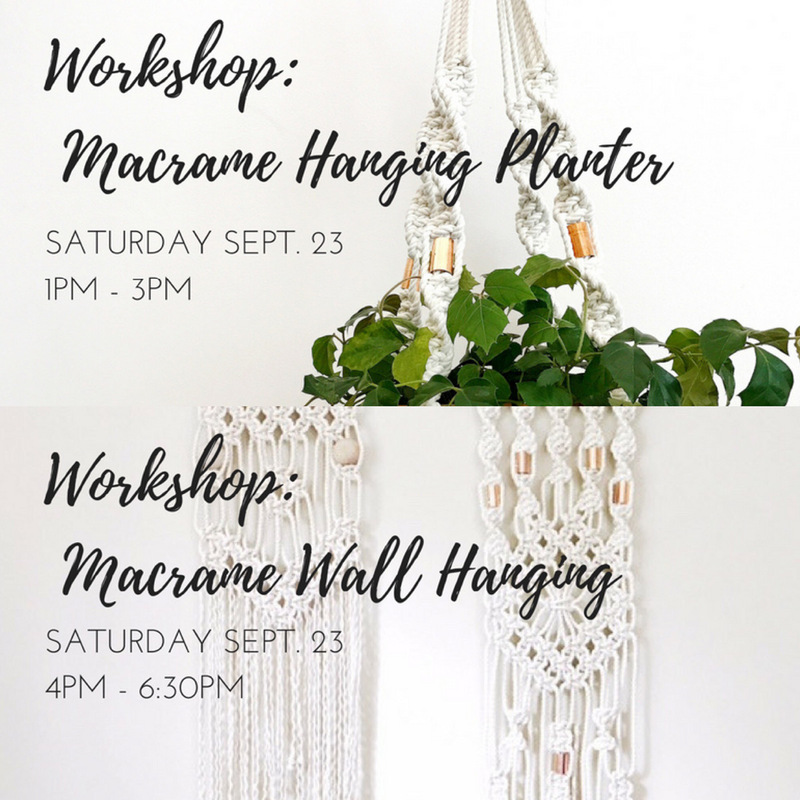 For more information and tickets for the Macrame Plant Hanger class, click here. And for the Macrame Wall Hanging class, here. Get your tickets while you still have time! That concludes our ICYMI: Week of September 8th! Keep up with our blog so you don’t miss out and be sure to keep following us on social media – where you can see things in (nearly) real-time! 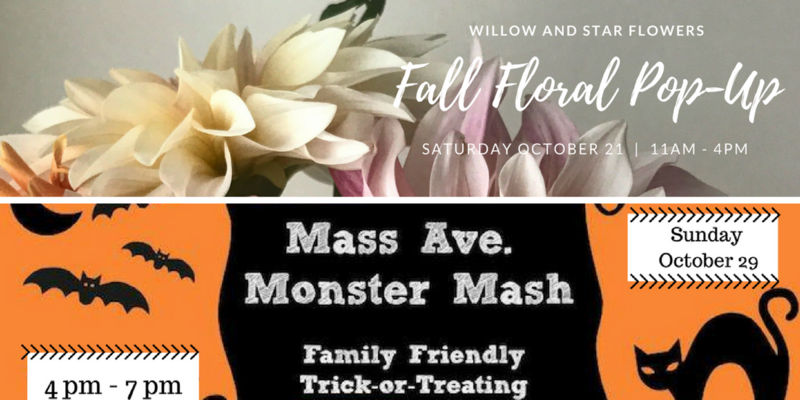 We hope to see you in the shop soon!